Price Beat Guarantee, 7 Day Rush Available. Corporate gifts work best when they are useful as well as unique. 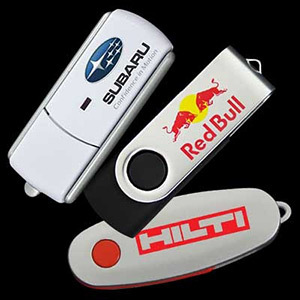 For this reason, it is best to opt for some custom-made flash drives when ordering looking at possible promo items. 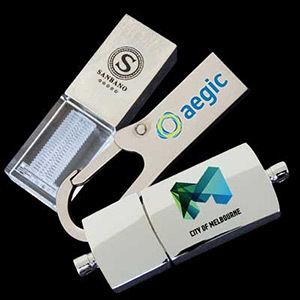 Dynamic Gift Auckland has a range of printed, branded USB sticks from 1GB to 256GB that are ideal for giving away to employees and clients of the company as gifts or for general office use. With your company name and logo printed on the side, you can hand out a useful item that is later seen in homes, offices, libraries and coffee shops around New Zealand. Get in touch today and let us arrange a quote on this great custom product that your customers will appreciate. Why choose custom USB drives? As we manufacture all our tech gadgets, you can be assured they are of the highest quality. Forget about suppliers that source their flash drives from an outside producer and opt for Dynamic Gift instead. 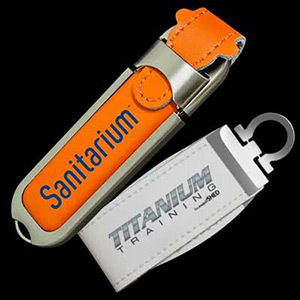 Whether you need a professional or novelty model, our custom logo USB drives come in unique, long-lasting designs at affordable bulk rates. Our range even lets you cater to different recipient needs as well with branded 2GB drives suitable for documents and images and 32GB sticks ideal for movies and other large files. Find an item that suits your client requirements as well as your budget! As mentioned before, corporate gifts need to be useful. Something like a custom USB flash drive will increase your commercial exposure as they are used in a range of places. Once you have printed your corporate name and logo on these flash drives, and handed them to staff and clients, they will be taken around your hometown and maybe even elsewhere in New Zealand. Whether you choose a 4GB or 128GB model, these products will spread word of your company around the world with a relatively small initial investment. Combining functionality with superb design, they are guaranteed to make a positive impression on the general public. At Dynamic Gift, we know that each company is unique. Because of this, we now stock a wide range of memory sticks from Christmas themed models to drives that include an added pen. Our branded flash drives can also come in wood, metal and plastic with your logo included for all models. For example, a cork drive would suit a timber company while our spanner-shaped products will match a hardware store. We even have business cards with inbuilt memory sticks with 8GB and 16GB capacities to be handed out for a positive impression at corporate events and conferences. If you have a specific logo or slogan in mind, our staff will come up with a design that fits in with your branding initiatives. For both USB 2.0 and USB 3.0 models, we will utilise the Pantone Matching System to ensure the colours are perfect. Working within your budget, we will still give you excellent quality results and affordable rates especially if you buy in bulk. Regardless of the capacity you desire, we will supply you with a wholesale custom flash drive that is functional and that looks great! Technology is taking over the world. Regardless of where a person looks, new technology is making an impact on their lives. As a result, individuals need easy access to data, whether it be in the form of files, programs, or documents. A business can benefit from this need by offering branded USB drives to customers, employees, suppliers, and more. All will appreciate the receipt of this item as it helps to reduce the stress in their life when it comes to managing their personal files and data. Individuals may use a custom USB drive for many things. In fact, each recipient may use the drive for a different purpose. 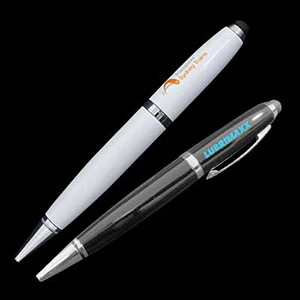 However, there are two main functions associated with these promotional items. 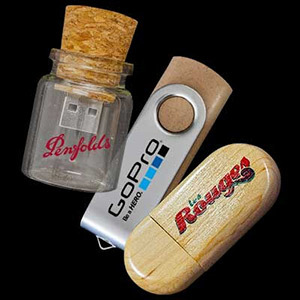 First and foremost, many companies offer the custom USB drive as a marketing tool. It becomes a promotional product simply by including a company name and logo on the drive, and its effectiveness has been clearly demonstrated. The drive works subtly to expose the user to the company name and logo routinely. While the recipient does not realize how the message is entering their brain, the branding message is continuously reinforced. As a result, the cost per impression is typically very low when this item is selected. Furthermore, when the custom drive is used as a marketing tool, it demonstrates the brand being advertised is modern and tech-savvy. Individuals who see the branded drive view the company as competent and ready to move into the future. Every business needs to understand how important this is in today’s increasingly technology-driven world. A company that passes out ballpoint pens simply won’t receive the same level of trust from consumers as pens are no longer an everyday object. Secondly, branded USB drives are practical. They allow the user to store and transfer large quantities of data both safely and securely. A company may choose to load the drive with a user’s manual, a video describing the features and benefits of the product, a video, or their product catalogue. These are only a few of the many practical uses for the drives, and a business is sure to think of countless others. Once the user sees how helpful the USB drive is, he or she will share this information with others, which likewise helps to promote the brand. Practicality is the main benefit of the branded drive. This item adds value to the user’s life and he or she remembers that. Furthermore, when the recipient thinks of the items stored on the drive, he or she likewise thinks of the company that provided the device, and this helps to cement the brand in his or her mind. Portability is another reason why many companies now opt for custom printed USB drives. A person can take the drive anywhere he or she goes, as it may easily be slipped into a pocket or carried on a keychain. People often don’t even think about taking this item with them at all times to ensure they have access to the data or multimedia whenever they need it. This increases the amount of exposure the business receives, which is always good. The USB drive helps to protect the data from damage. Many users aren’t aware of this benefit but appreciate having access to their data without worry that it will be corrupted when they want or need it. Electromagnetic interference is never an issue with these drives and, unlike with compact discs, the drive isn’t vulnerable to scratches or surface damage. 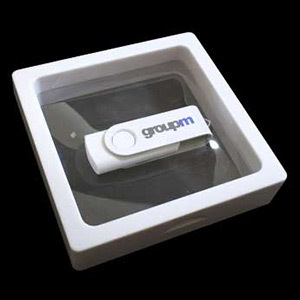 Furthermore, a promotional USB drive with your logo branding is secure. Hardware encryption may be used to protect sensitive data and ensure it is not shared with anyone it is not meant for. Companies that have previously been hesitant to provide these items find this eases their mind and they can make the purchase without concern of unauthorized access to the data. Finally, custom USB drives are inexpensive. A business may not consider this option, simply assuming they are expensive. However, they cost much less than many imagine and the return on investment is outstanding. If you are looking for a way to market your business in an environmentally friendly way and one that will reflect positively on your organization, showing it to be modern and cutting edge, look no further than branded USB drives. As every person has a use for this type of device, the business will get the exposure they desire when purchasing promotional products and won’t spend a fortune while doing so. Go one step further and avoid using inks with our laser engraved usb sticks which offer a long lasting, more vintage look.